Our corporate division specializes in conventions, trade shows, national tours and a variety of other high profile events. 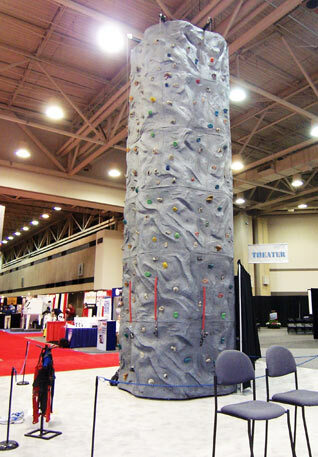 We offer a wide variety of products that work well in the corporate arena, including mechanical bull riding, wax hand machines, sports games, interactives, and indoor rock climbing walls from 12’ to 25’ to accommodate a variety of venues. We provide a highly visible experiential learning experience that will ensure the attendees will be excited to come visit your booth instead of being harassed as they walk by it. Our company has assisted our clients to receive many "Best of Show" awards and are always one of the most photographed and popular exhibits, helping to create the brand awareness you are looking for. Our professional staff members with backgrounds ranging from trade show management to marketing fully understand the complexities of the corporate arena and are trained to help our clients maximize their efforts to accomplish their objectives. PRC has assisted Microsoft, ESPN, Nissan, North American Mission Board and numerous other industry leaders reach their target markets by offering a fun, interactive break from the norm. Our clients have been so impressed with the response they receive and the quality of our presentation, almost every one of them immediately reserves our services for additional events. 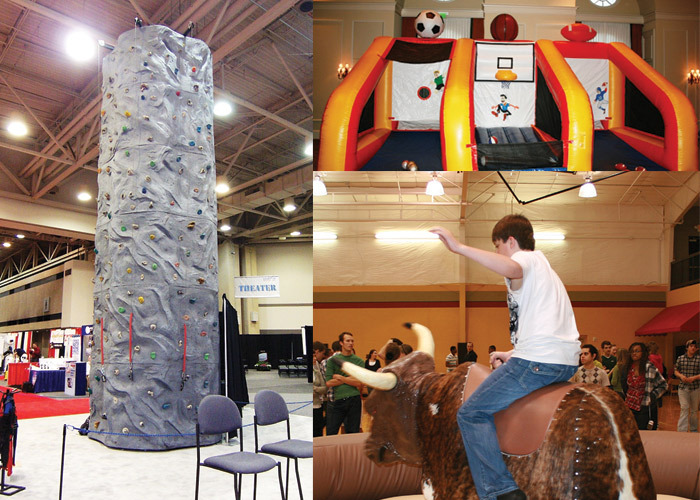 The Mechanical Bull and Triple Play sports arena are just a few of the other items that work well for trade shows and Conventions. Call us and we can customize an experience for your show. Read more about our the featured client events below: X-Games, , NAMB, Franklin-Covey, Microsoft . Franklin-Covey built a studio around our rock climbing wall to include the ability to experience rock climbing through virtual reality simulation and then move on to try rock climbing first hand. The booth was a huge success and our services were utilized again in Dallas, San Francisco, Orlando, Atlanta and Nashville. 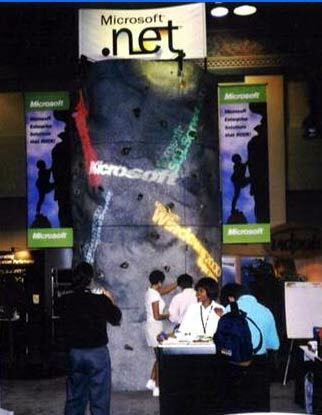 Microsoft allowed show attendees an interactive experience of rock climbing and entered each successful climber into a drawing, giving away thousands of dollars of software throughout the show. They were so pleased Microsoft had us back for the Atlanta, San Diego, San Antonio and Dallas trade shows. ESPN X-Games is second only to the Olympics in total viewers and attendees. The X-Games has become the pinnacle of extreme sporting events. 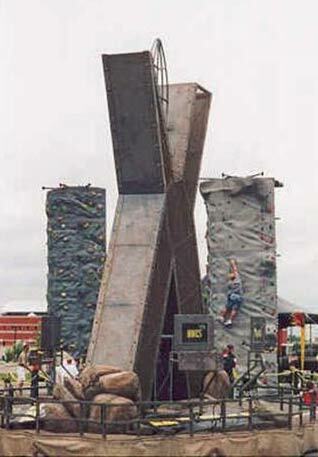 Our free standing rock climbing walls were a huge hit with the generation X crowd and we were featured at the Dallas, St. Petersburg, Nashville, Atlanta åand Philadelphia X-Games. 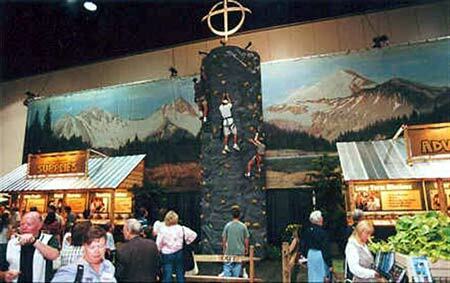 NAMB North American Mission Board produced exhibit areas at their shows that were absolutely amazing. Using actual set backdrops from Hollywood with a mountain landscape and encompassing our rock climbing wall surrounded by rustic forts and even an artificial river the crowds were blown away. 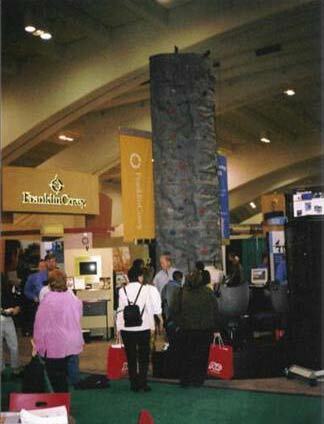 NAMB knew they had a winner and used our rock climbing wall to wow the attendees in Nashville, Orlando, Dallas and St. Louis.